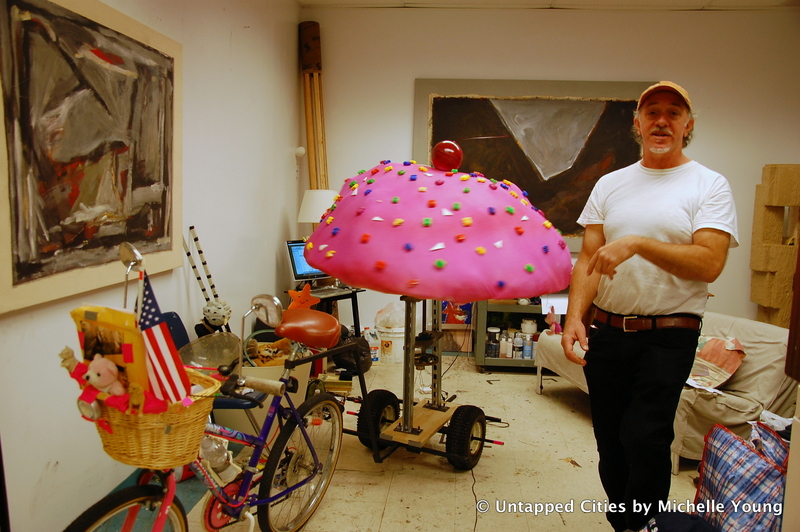 Untapped caught up with Jack Cesareo, alias Cupcake Man, at his studio in Harlem today. 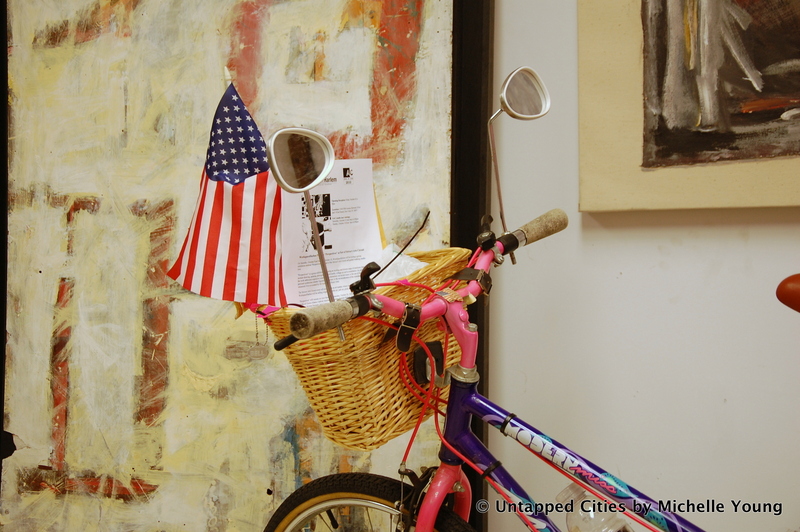 Jack started biking with an oversized cupcake in tow last month and it goes without saying that people are curious. I met him (and cupcake) on the Low Library steps at Columbia University, as little kids were ecstatically jumping up and down to the sight. Some days he can’t even escape to the bathroom without getting stampeded by excited children and parents. Contrary to our capitalist-laden assumptions, he’s not selling cupcakes–it’s purely an art project. He photographs the cupcake juxtaposed against famous New York City landmarks and has plans to take it global. “I’m hoping to get to Paris and Australia,” he tells me as we chat in his studio at Work Space Harlem on 5th avenue and 141st Street. Besides the giant cupcake, I think what caught me was the deliberate framing of the photographs and the play on depth-of-field and perspective. When a landmark is so often photographed it can disappear from your consciousness, until an object incongruously disrupts that complacency. The bike itself was also part of a fortuitous happenstance: he came across it with a sign that said “PLEASE TAKE!” and he couldn’t say no. 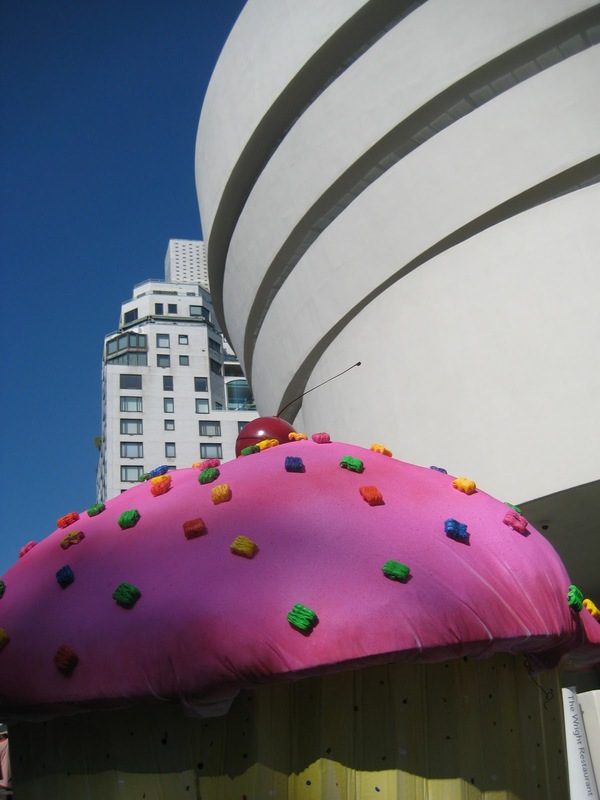 Jack has taken the cupcake to the Guggenheim, the Metropolitan Museum, Apollo Theater, Brooklyn Bridge, Queensboro Bridge and more. So far, people have been curious and supportive of the cupcake project but he’s had some people “think the cherry is TNT or something.” To counter this, he added an American flag to the basket, along with his mascots who are a tribute to his handicapped dogs. 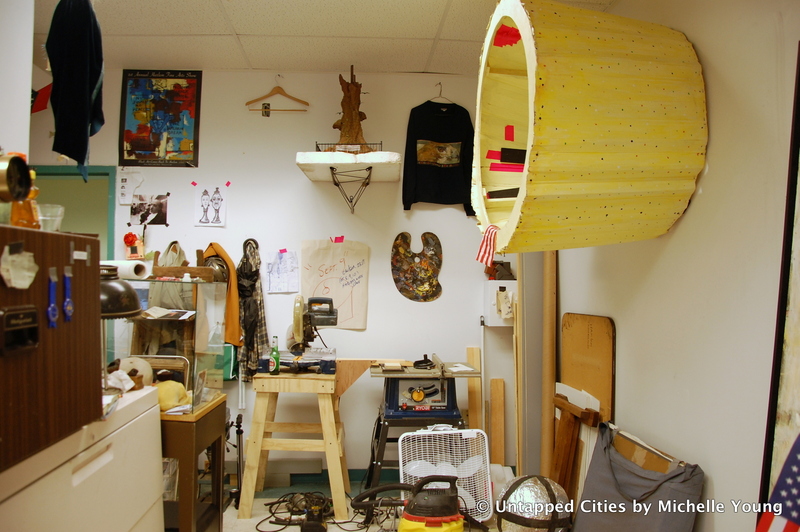 Jack’s studio is an eclectic mix of his paintings, cupcake related construction, found objects and music equipment for his band. This is someone who understands that random objects and occurrences can be reconfigured into transcendent and whimsical moments. So far though, the cupcake has been hit or miss with hipsters. Out in DUMBO, a hipster told him, “That’s cute. What’s that supposed to be? '” When Jack told him it was an art project, the guy responded, “I would use maybe a mo-ped.” “My cupcake is Green,” Jack replied and reminisces now that the guy could have retorted it was hot pink, but instead he said, “Oh we like Green.” To help the cupcake get back to its rockstar roots, Jack and I have decided the cupcake will greet concert-goers for my band at our Pete’s Candy Store CMJ showcase on October 22nd. It will also be the cupcake’s first visit to Williamsburg. 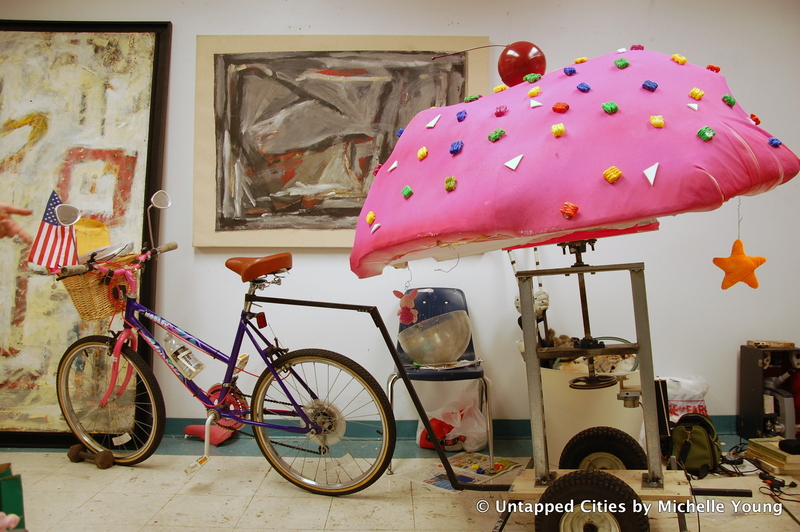 Today, the cupcake was being transformed into a carousel for an upcoming exhibition at Work Space Harlem beginning this Friday, October 8th. There will be an opening reception from 6-8pm on Friday and the exhibit will be on-going until October 20th, featuring the work of his fellow studio mates. The Inner Workings of Cupcake! on oct 22nd, he’ll be at pete’s candy store! 9pm for kitten ablaze’s CMJ show. come see us! 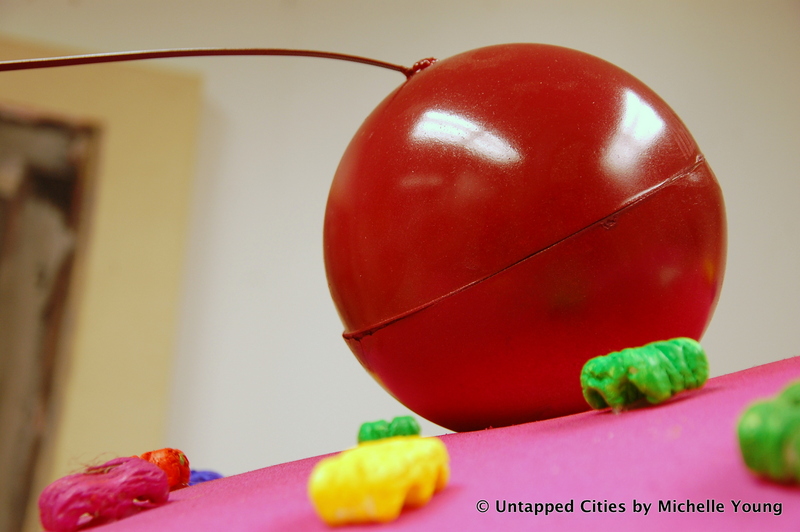 I’ve been acquainted with the cupcake since the Globular Cluster show and have been watching it take over the city every since. Go pink cupcake go! !